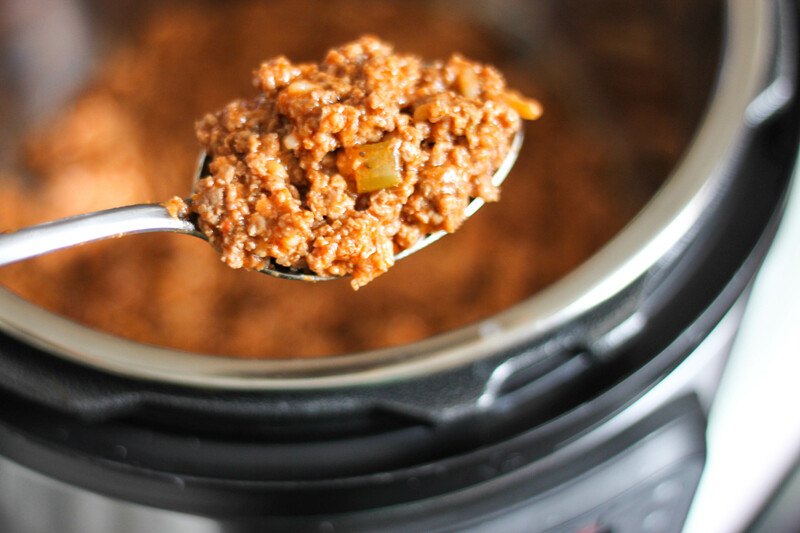 Are you looking for an easy ground beef recipe for your Instant Pot? These Tavern Sandwiches are a loose meat sandwich recipe the whole family will love. 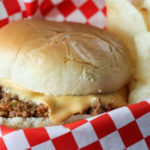 My husband said these were the best Sloppy Joe’s (before I told him they had another name!) he had ever had! I normally make sloppy joe’s with a sweet sauce but when I saw this recipe in the Gooseberry Patch Hometown Christmas Cookbook I knew it would be a hit! These sandwiches have a unique ingredient. I will be honest I thought it was a little weird to put a can of chicken gumbo soup in this recipe but the results are yummy! I made these Tavern Sandwiches in the Instant Pot for a quick weeknight dinner. Stove Top Instructions: In a medium skillet brown ground beef and drain. Add remaining ingredients and simmer for 20-30 minutes. Crock Pot Instructions: In a medium skillet brown ground beef and drain. Add all ingredients to a crock pot and cook on low for 2-4 hours. Serve on a bun with a slice of American cheese! If you are using a lean beef add the whole can of gumbo soup to make sure you have about 1 cup of liquid. With lid off turn on the Instant Pot and select the Saute button.You will want to saute on "normal" aka medium heat. Cook ground beef until no longer pink, hit cancel to shut off saute feature and drain. Add remaining ingredients (except cheese and bun) to pressure cooker. With lid on cook on high pressure with manual mode for 7 minutes. Spoon beef mixture onto bun and add cheese slice to serve. i’ve made mine this way for years! They are the best! It’s been years since I’ve had Sloppy Joe’s. Your recipe sounds delicious, especially with the added cheese slice. I’m not on the Instant Pot bandwagon yet, so thanks for the “old school” instructions! lol! I can of tomato soup and 1 can of chicken gumbo. The chicken gumbo soup has a lot of broth in it so I pour about half of the liquid out so the sandwich mixture isn’t runny. Hi, saw your recipe on Southern Plate and followed the link here. I will be making these soon. TY for sharing. Added to my pressure cooker pinterest board. Welcome Barbara! Hope you enjoy them! Thanks for pinning the recipe! I made these tonight super easy .. cant wait to dig in!!!! Thank you Liz. These are the best sandwiches I have ever had. I made this the other night following all the instructions. The down side is that it browned and stuck to the bottom of the pot a bit, but not too bad. The up side is that this was DELISH! My hubby and I both loved it and it was really nice to find something out of the ordinary to make. Keeper in my recipe book. Thanks for sharing! Trying to find recipe that could work for a loose meat sandwich but also serve as a meat topping on nachos. Would this recipe work for that? I’m not sure how it would be for nachos. The best description of this would be a savory sloppy joe. Have you ever froze the leftovers? We are a family of 2 adults and 1 child…2 pounds of meat seems like too much. But it doesn’t seem feasible to cut the recipe in half with the soup requirements. Thoughts…? I haven’t ever froze them but I think it would be okay. Found this recipe some years ago but it just called for the gumbo soup no tomato soup. And YES they are GREAT!!! What’s your go-to brand of chicken gumbo soup? Mine (Campbell’s) has a bunch of rice in it… does yours? Yes it does have rice in it but you don’t notice it. My husband doesn’t like rice but he loves this sandwich. That’s the beauty of the Instapot, it seems like you can cook everything in it. Now if the witch from “Hansel and Gretel” had it, she wouldn’t have expired unexpectedly. Anyways, the tavern sandwich recipe looks good. Are there any subtle differences if you use lean ground beef as opposed to higher fat beef (I always prefer high-fat). Just wondering if there’s any difference in cooking time, etc. Thanks! Cooking time doesn’t change but the amount of liquid does. You need liquid for pressure cooking. If using a lower fat ground beef or draining your beef I would add the whole can of chicken gumbo. Enjoy! I followed the recipe exactly, adding the full undrained can of gumbo soup plus some extra water to it. It didn’t go to high pressure, instead it went to “burn”. I have two pots so I put what didn’t burn into the clean pot, added some extra water, turned to low pressure. Again it burned. I have watery tavern sandwich mix and two pots with burned mix in the bottom.Good recipe, but don’t think I will try it again in my IP. I received my IP just after Christmas. I’m a new mom, at the time my son is only a month old. As I loved cooking also I love to spend more time with my baby. Most of the time I got frustrated if I can’t finish preparing the food before my husband arrive. But thanks to the IP, no more frustration I can set the timer in my IP and it will do the job for me while I can spend more time with my baby and serve delicious meal. With the IP is like I hired a helper and the good part is I don’t have to pay. So excited to explore more on IP. It looks easy to make! Will try it tonight! I love this recipe but it’s getting harder and harder to find the Chicken Gumbo soup that Cambells may have discontinued. Any suggestions for substitutions? I just looked on their website and it still shows it as an option. Amazon has it available in a 12 pk… https://amzn.to/2JJCozj sorry I can’t be more help! I made this tonight and it was delicious! After browning and mixing everything, I places lid in and high pressure set for 7mimutes, the burn light came on. There isn’t a lot of juice, but I followed instructions. Any ideas? Ground beef can have different amounts of moisture/liquid/fat. For a pressure cooker recipe you need about 1 cup of liquid per recipe. I would add the full can of gumbo soup and if there doesn’t seem like you have a cup of liquid still I would add some water. These were what our family always called Gumbo Burgers. My aunt would bring a big roaster full of the filling. for large family gatherings. 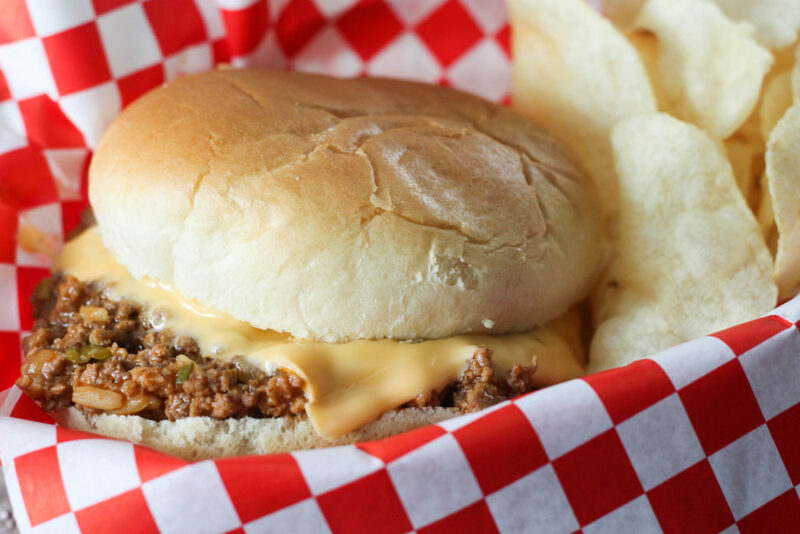 I never knew “sloppy joes” were anything but Gumbo Burgers until I grew up and moved out into the world. We didn’t use the tomato soup, either, just the Gumbo Soup.